The main opposition Maldivian Democratic Party (MDP) has proposed asking the Indian government to assign a mediator for all-party talks in the Maldives. MDP MP Imthiyaz Fahmy told the press today that the party believes an independent mediator is important to ensure a positive outcome. Fahmy said the mediator should be acceptable to all sides. “India’s role has always been very important in resolving every challenge facing the Maldives’ political sphere. If a mediator could be arranged from India, we believe it will increase confidence both for the government and the MDP,” he said. The talks between the government and MDP are due to begin after the opposition party agreed to enter negotiations without former President Mohamed Nasheed as a representative. The government had rejected the opposition leader as a representative on the grounds that he is serving a 13-year jail sentence. Nasheed was transferred to house arrest this week in an apparent step towards political reconciliation. Fahmy said the MDP will propose five papers for discussion with the government tomorrow, including a proposal for changing to a parliamentary system. The MDP national council had compiled a draft paper earlier this month laying out a roadmap for political reconciliation. The paper had proposed transferring jailed opposition leaders to house arrest as a measure to build confidence and trust between the government and opposition. The MDP’s proposals include conducting the talks among all political parties, including the ruling Progressive Party of Maldives (PPM), dropping charges against opposition supporters arrested from protests, reinstating opposition supporters fired for attending protests, and reviewing disciplinary action taken against opposition councillors. Other areas of discussion include reforming the judiciary through reviewing the composition of the Judicial Service Commission, restraining the powers of the Supreme Court, and setting a university degree as the minimum qualification for judges. Under the party’s proposal for shifting to a parliamentary system, President Abdulla Yameen would remain the head of state and the current parliament would remain unchanged, Imthiyaz said. The ruling coalition with its comfortable majority of 48 seats in the 85-house can designate a prime minister, he added. Fahmy said the political instability the Maldives has experienced since the first multi-party presidential election in 2008 stemmed from shortcomings in the presidential system. Coalitions led by the MDP and the PPM had won the 2008 and 2013 presidential elections, respectively, but soon disintegrated, Fahmy noted, contending that coalitions were incompatible with the presidential system. The MDP is also proposing re-appointing members to independent commissions through consensus among political parties and formulating foreign policy to ensure peace and security in the Indian Ocean. The Maldives should not be overly dependent on China and stay clear of “disagreements and disputes between India and China,” Fahmy said. Both the MDP and Amnesty International has previously sought Indian pressure to secure the release of jailed opposition politicians. Following Nasheed’s arrest and prosecution on controversial terrorism charges in February, Modi dropped the Maldives from a tour of Indian Ocean neighbours in early March. The People’s Majlis today banned the use of horns, sirens and megaphones in the parliament chamber following weeks of protests by opposition MPs. MPs of the Maldivian Democratic Party and Jumhooree Party have been protesting since March 2 over the arrest and imprisonment of former president Mohamed Nasheed on terrorism charges. Opposition MPs continued protests with horns and megaphones today, but Speaker Abdulla Maseeh Mohamed called for a vote on the changes proposed to the parliamentary rules despite the disorder in the chamber. The changes were proposed by the speaker and approved with 43 votes in favour at today’s sitting. The debate on the bill was once again inaudible to the viewing gallery and the parliament secretariat ceased providing a live feed of the sittings to television stations this morning. “Work on bringing an end to the MDP’s horns by amending article 51 of the parliament rules is on the agenda today,” tweeted majority leader Ahmed Nihan before today’s sitting. Nihan was not responding to calls at the time of publication. 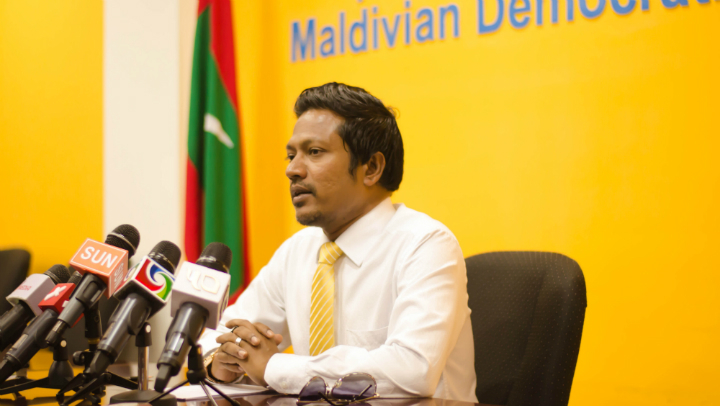 MDP spokesperson Imthiyaz Fahmy told Minivan News today that opposition MPs will continue the protests. With daily anti-government demonstrations and heightened political tension, the state of the nation shall be reflected in the People’s Majlis, he said. “While democratic principles are destroyed and political leaders are jailed, the Majlis is a place where such issues can be resolved,” he said. The MPs are calling for a resolution to the political crisis, but the “current majority party does not want to listen,” he added. Imthiyaz also questioned the need for the changes as the rules allow the speaker to order the sergeant-at-arms to expel MPs who disrupt sittings. He contended that laws were passed in recent weeks in violation of parliamentary rules as voting took place with disorder in the chamber. Constituencies represented by opposition MPs did not have a say either, he added. Previous speakers resolved disputes through dialogue with political parties, but the current speaker “is too dictatorial and doesn’t even want to talk to the minority,” he said. Maseeh is conducting sittings in violation of the rules while insisting that there was order in the chamber despite the protests, Imthiyaz said. But neither the speaker nor MPs were able to hear debates, he noted. Last week, a three-month delay for the implementation of the new penal code was approved with a show of hands amid protests by MDP MPs. The new provisions state that cases of MPs who use horns or megaphones and approach the speaker’s desk will be investigated by the ethics committee. The committee can cut 55 percent of an MPs’ monthly committee allowance and suspend participation in an official parliament trip for six months. Imthiyaz said the proposed punishment was “ridiculous” as it amounted to undoing or erasing committee attendance. MPs receive a monthly allowance of MVR20,000 for attending more than 50 percent of committee meeting. The purpose of today’s changes to impose pay cuts on opposition MPs as the ruling coalition lacked two-third majority required by the constitution for non-payment of salaries and allowances, he said. He also noted that the MDP parliamentary group leader sent a letter to Maseeh expressing concern with sittings taking place in violation of the rules. However, in a meeting last week, Maseeh insisted that he was following the rules. Imthiyaz also objected to the speaker refusing to allow MDP MPs to speak during debates and advocate on behalf of their constituents. 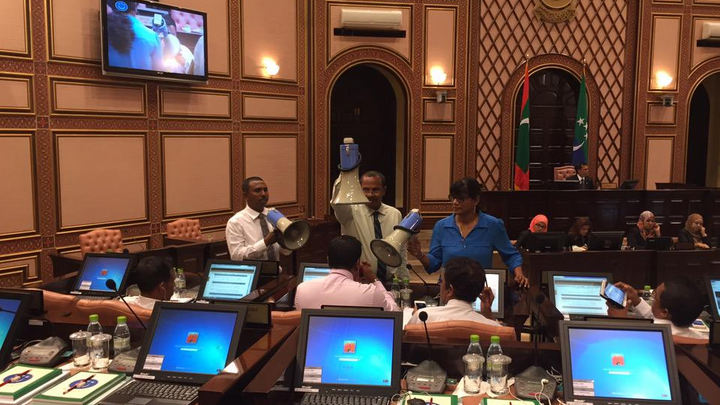 At a previous sitting, deputy speaker ‘Reeko’ Moosa Manik refused to allow MDP MP Mariya Ahmed Didi to speak. Imthiyaz said Mariya was seated, but the deputy speaker said the MDP MP will not be allowed to speak while her fellow MPs were protesting. The main opposition Maldivian Democratic Party (MDP) has suspended protests in the People’s Majlis (parliament) chamber as it meets with the speaker to seek a negotiated solution to a standoff with the government. 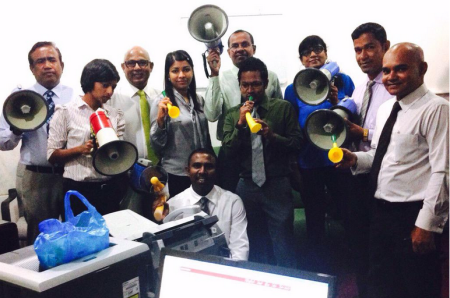 Parliament resumed providing a live feed of sittings to television stations, a popular service which had been suspended for over a month while the MDP parliamentarians protested with whistles, sirens and megaphones in the chamber. MDP spokesperson Imthiyaz Fahmy said the minority parliamentary group was awaiting a response to a letter sent to Speaker Abdulla Maseeh Mohamed expressing concern over parliament sittings allegedly taking place in violation of procedural rules. “And as a meeting has been arranged between MDP parliamentary group leader and the Majlis speaker, the MDP parliamentary group has decided to halt the protest to give room for discussions,” the MP for Maafanu North said. Imthiyaz told Minivan News that the MPs were not boycotting the sittings, as reported in other media. The MPs were inside the parliament building, but were not entering the chamber, he said. “Because if we go inside we will have to protest,” he said. 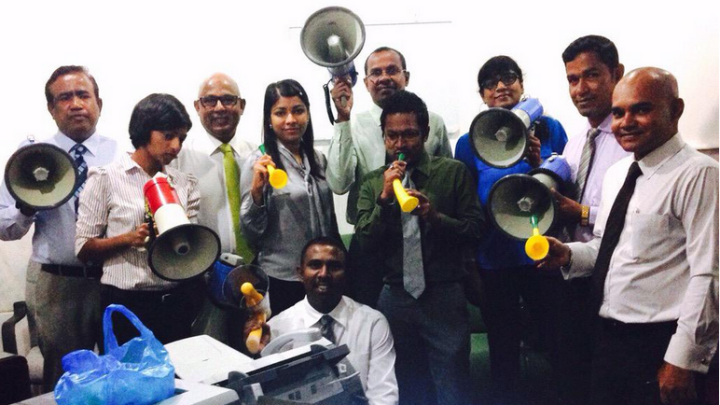 Since parliament returned from recess in March, MDP MPs have been protesting on the Majlis floor with sirens, whistles and megaphones, calling for the release of former president Mohamed Nasheed, who was jailed last month for 13 years on terrorism charges. However, Speaker Maseeh continued proceedings despite the disorder in the chamber. Parliament also ceased providing a live feed of the sittings to television stations while the debate on bills was inaudible to the viewing gallery. The parliament secretariat told local media that the actions and words of the MPs during the protests were “against societal norms and unfit for public viewing”. In the absence of the MDP MPs, debate and voting at today’s sitting proceeded without incident. However, amendments submitted to the constitution by government-aligned MP Ahmed Amir were not put up for a vote at today’s sitting due to the lack of a quorum. Amending the constitution requires the support of a three-quarters majority of the 85-member house. A quorum of 64 MPs was needed to call the vote, but only 45 MPs were in attendance. The MDP has 21 MPs while at least 13 more are opposition-aligned. Amir had proposed removing two clauses from article 231 of the constitution, clauses which specify that local councils shall be elected for a three-year term and that chairs and deputy chairs shall be elected through a secret ballot by councillors. The Maldives Development Alliance MP for Dhaal Kudahuvadhoo proposed specifying both the terms and process of electing chairs and deputy chairs in the Decentralisation Act. Earlier in the sitting, preliminary debate began on a public service media bill, during which several ruling Progressive Party of Maldives MPs expressed gratitude to the minority party MPs for ceasing their disruptive protests. The government-sponsored legislation seeks to replace the current state broadcaster – the Maldives Broadcasting Corporation (MBC), which operates a television station and radio channel – with a new public service media company. The company is to be operated by a seven-member governing board appointed by the president and approved by parliament. If the law is passed, the MBC and its executive board would be dissolved. During the debate, pro-government MPs criticised the state broadcaster for not providing enough coverage of the government’s services, programmes, and development projects. Several MPs also accused the state broadcaster of focusing too heavily on the capital and ignoring events and developments in the atolls. Following the debate, the bill was accepted for consideration with 43 votes in favour and one abstention, and was sent to committee for further review. Debate also began on amendments submitted to the Elections Commission Act by Deputy Speaker ‘Reeko’ Moosa Manik, who proposed mandating the commission to oversee and conduct presidential primaries of political parties. Separately, the former MDP chairperson – who was expelled from the party last year after repeatedly defying three-line whips – declared that he will be the main opposition party’s presidential candidate for 2018, although the party says its candidate is former president Nasheed. The Independent MP for Hulhuhenveiru told parliament that he was ousted for announcing his intention to challenge Nasheed for the party’s ticket, claiming that that the opposition leader’s family controls the MDP. He also criticised the MDP’s new alliance with the religious conservative Adhaalath Party and the Jumhooree Party. Both parties were responsible for the fall of the MDP government in February 2012, Moosa said. Moosa’s bill was accepted with 44 votes in favour and sent to committee. The Maldivian Democratic Party (MDP) has accused President Abdulla Yameen of manipulating the judiciary to remove opponents, as court proceedings related to former President Mohamed Nasheed’s trial resume tomorrow. In a press conference held ahead of the High Court trial challenging the legality of the Hulhumalé Magistrates Court’s bench, MDP spokesman Imthiyaz Fahmy suggested that “a very unpopular government” was trying to “invalidate the candidacy of all of President Yameen’s competitors”. The case will consider Nasheed’s appeal against the assembly of the court’s bench, appointed to try him for the detention of Criminal Court Judge Abdulla Mohamed in January 2012. Fahmy today suggested that the government’s attitude towards the judge’s detention – which stoked anti-government protests before Nasheed’s controversial resignation on February 7 – was reflected in the recent appointment of a fellow defendant in the case as defence minister. “If the government believes that the case against President Nasheed is serious; if the case has any substance, why would the government appoint Moosa Ali Jaleel as the defence minister?” asked Fahmy. Formerly the chief of defence forces, Jaleel retired after 32-years of service following Nasheed’s resignation, later telling parliament’s government oversight committee that he believed the MDP leader had “resigned under duress”. Fahmy today also suggested that the Supreme Court’s recent decision to reduce the period allowed for legal appeal was an effort to hastily sentence Nasheed before the implementation of the new penal code in April. The court’s decision reduces the time allowed to file appeals in the higher courts from 90 days (180 for cases from the atolls) to ten, prompting legal experts to accuse the court of infringing upon the constitutional right to an appeal. “The new penal code does not have the article under which President Nasheed is being prosecuted nor does it have a specified punishment,” continued Fahmy. If convicted under the old legal code, Nasheed could face imprisonment or banishment for three years – leaving him ineligible for the 2018 presidential race, under Article 109 (f) of the Constitution. Nasheed’s MDP has recently formed an alliance with the Jumhooree Party (JP) in defence of what it regards as persistent breaches of the Constitution. The eligibility of the JP’s leader, Gasim Ibrahim, is also under threat after the ruling Progressive Party of Maldives proposed constitutional amendments that would deem him too old to contest the presidency for a third time in 2018. During tomorrow’s hearing, Nasheed’s legal team and the Judicial Services Commission – which assembled the Hulhumalé Magistrate Court’s bench – will be given ten minutes each to summarise arguments and raise further points regarding procedural issues raised before the case was halted in April 2013. The judicial watchdog has raised a procedural issue claiming that the High Court does not have the jurisdiction to oversee the case. After the announcement of the trial, Nasheed’s legal team had requested a one and a half month delay in the trials as further time was required to “review and research the case after recent developments in the judicial system”. Nasheed’s lawyers have previously challenged – unsuccessfully – the establishment of a magistrates court in the Malé suburb, arguing that Hulhumalé is considered to be part of Malé City under the Decentralisation Act and therefore does not require a separate court. United Nations Special Rapporteur on the Independence of Judges and Lawyers Gabriela Knaul has previously noted that the “appointment of judges to the case, has been set up in an arbitrary manner outside the parameters laid out in the laws”. The opposition Maldivian Democratic Party’s (MDP) parliamentary group has decided to make a recommendation to the party’s national executive committee (NEC) to challenge the constitutionality of amendments brought to the Audit Act last week. “The NEC will make a decision tomorrow,” MP Rozaina Adam said at a press conference this morning. Rozaina argued that the amendment stipulating that the president shall reappoint an auditor general within 30 days was unconstitutional. Progressive Party of Maldives (PPM) MP Ahmed Thoriq had proposed adding a clause to the audit law stating that the president shall nominate for parliamentary approval an individual or individuals to the post of auditor general within 30 days of ratifying the amendments. The amendment was passed with 36 votes in favour and 22 against at Wednesday’s (October 29) sitting of parliament. At today’s press conference, MP Imthiyaz Fahmy meanwhile stressed the importance of the public protesting the unconstitutional move. Imthiyaz said he had learned that parliament’s Counselor General Fathmath Filza had also advised Speaker Abdulla Maseeh Mohamed that the amendment was unconstitutional. President Abdulla Yameen ratified the amendments less than 24 hours after it was passed, he noted. Imthiyaz said the haste with which the amendment was passed and ratified shows the PPM government’s eagerness to replace the auditor general following allegations of corruption made against the party’s deputy leader – Tourism Minister Ahmed Adeeb – in a special audit report of the Maldives Marketing and Public Relations Company (MMPRC). Meanwhile, Auditor General Niyaz Ibrahim told newspaper Haveeru last night that he would also contest the constitutionality of the amendment at the Supreme Court. The amendment contravenes the process specified in the Constitution for the appointment and removal of the auditor general, Niyaz contended. Article 218 of the Constitution states that the auditor general could be removed from office “(a) on the ground of misconduct, incapacity or incompetence; and (b) a finding to that effect by a committee of the People’s Majlis, pursuant to article (a) and upon the approval of such finding by the People’s Majlis by a majority of those present and voting, calling for the Auditor General’s removal from office”. Niyaz told the local daily that he does not intend to remain in the post even if the Supreme Court strikes down the amendment. Following the release of the MMPRC special audit report, Niyaz revealed that death threats were sent to both himself and his family. Niyaz is currently on leave. Thoriq noted that the Audit Act was passed in 2007 before the ratification of the Constitution the following year and did not specify the responsibilities, mandate, qualification and ethical standards of the auditor general. PPM MP Ibrahim Waheed has meanwhile told local media that the post of auditor general became vacant with the president’s ratification of the amendments. Waheed contended that as Niyaz was appointed under the 2007 audit law, a new auditor general must be appointed in accordance with the Constitution following the amendments to the Audit Act. Waheed argued that Niyaz was appointed in the absence of a law passed after the adoption of the Constitution in August 2008. “So the legal obligations and responsibilities of the present Auditor General will stop. And if he is willing to go ahead, he also has to apply to the post just like others. An Auditor General will be appointed under this constitution after the parliament approves the name sent by the president,” he was quoted as saying by Sun Online. The 17th People’s Majlis had unanimously approved former President Mohamed Nasheed’s nomination of Niyaz Ibrahim to the post of auditor general in May 2011. Former Commissioner of Police and Jumhooree Party (JP) MP Abdulla Riyaz has called on the government to form an independent commission of inquiry to look into the escape of two convicts from Maafushi jail on Friday (October 17). “I believe the [escape] of those who should be kept apart from society was due to the failure of an institution to properly fulfil its legally mandated responsibility,” Riyaz said during debate on an urgent motion submitted by Maldivian Democratic Party (MDP) MP Imthiyaz Fahmy at today’s sitting of parliament. The MP for Kinbidhoo also advised strengthening the prisons department and ensuring that it is able to function professionally, claiming that the post of its highest-ranking official had changed three times during the past year. Competent persons should be appointed to such posts, Riyaz continued, adding that he had confidence in the ability of the security services to find the escaped convicts. In an appearance on state broadcaster Television Maldives on Sunday night (October 19), Home Minister Umar Naseer revealed that investigations were ongoing to determine whether prison guards were complicit in the escape. “Nothing we have so far found in the investigation indicates any negligence or involvement of prison guards. However, if such a thing comes to our notice, we will take immediate action,” he said. Opposition MPs meanwhile contended that the government’s “negligence and irresponsibility” allowed the dangerous criminals to break out from a high security prison. “We believe this is an alarm bell for the loss of domestic security,” the MP for Maafanu North said. Imthiyaz’s early day motion or motion without notice was accepted for debate unanimously with 53 votes in favour, which opened the People’s Majlis floor for a one-hour debate. Public fears over personal safety and security was “a characteristic of a failed state.,” Imthiyaz continued. Referring to the suspected abduction of Minivan News journalist Ahmed Rilwan, Imthiyaz noted Home Minister Umar Naseer’s acknowledgement of the involvement of gangs in Rilwan’s disappearance. Weeks before Rilwan went missing, Imthiyaz said MDP had alerted the government to the actions of a vigilante group who abducted several young men in June. The release of suspects who attacked an MDP rally in Addu City was a further sign of the state of the nation, Imthiyaz continued. “But the government said at the time that the case would be investigated with the utmost seriousness. Police were also attacked,” he said. MDP MP Eva Abdulla noted that four murders and more than 30 violent assaults have taken place since the end of Ramadan. “Death threats have been sent to about 15 journalists and 16 MPs as well as our families,” she said. Moreover, she added, the main opposition party’s office was torched, crude oil was thrown on the residence of former President Mohamed Nasheed, and the car of MDP Chairperson Ali Waheed’s was vandalised. “This is the state of the country today. This is one side of the news,” she said. On the other hand, Eva continued, media reports have revealed that police are unable to identify the source of the death threats, a suspect arrested after a machete was buried in the Minivan News office door was released by the court, and eyewitnesses to violent assaults are scared to testify in court. Pro-government MPs meanwhile criticised the MDP government’s track record and referred to the military’s controversial detention of Criminal Court Chief Judge Abdulla Mohamed, the arrests of then-opposition MPs Abdulla Yameen and Gasim Ibrahim, and inmates setting fire to the Maafushi jail on two occasions in 2009. Hoarafushi MP Mohamed Ismail claimed that the MDP government released 700 dangerous convicts. MP Ahmed Nihan, parliamentary group leader of the ruling Progressive Party of Maldives (PPM), alleged that the MDP formed a “big cell” within the party to create ties with inmates following the prison riot in September 2003. Referring to the arson attacks on February 8, 2012, Nihan alleged that the MDP had “sponsored terrorism”. While the current administration should bear responsibility for the prison break, Nihan assured that the government would control jails. “People escape from jail in all countries of the world,” he said, adding that he was pleased some MDP MPs were willing to assist and cooperate with the government. The Maldives Journalist Association (MJA) has called on the government to amend controversial new regulations enacted this week that subjects prose and poetry published in the Maldives to government approval. “The Article does not state that free expression could be restricted by law. Only expressions or opinions contrary to a tenet of Islam are restricted,” the MJA observed. While the MJA urged a proper review of regulations before enforcement or publication in the government gazette, opposition MPs, civil society, and the information commissioner have also criticised the new rules. The regulations prohibit publishing literary material without seeking authorisation from the national bureau of classification (NBC) – which functions under the youth ministry – and prescribes a fine of between MVR500 (US$32) and MVR5,000 (US$324) for violations. Following an outcry on social media yesterday, the youth and sports ministry issued a press statement claiming that the rules would not apply to either social media or registered newspapers and online news outlets. “We note that approving books, poetry and songs published in the Maldives is not a new rule but has been done by this bureau for many years as well as at present,” the statement read. Information Commissioner Abdul Azeez Jamal Abubakur told Minivan News today that he met members of the bureau and senior officials at the youth ministry yesterday and expressed his concerns. “They accepted [the concerns] and said they would release a press statement and would try to amend the regulations through [the People’s] Majlis,” he said. Azeez suggested that the regulations had “slipped through their fingers” and ended up in a very restrictive or “difficult” form. “If the regulations are enforced the way it is now, we can’t publish poetry on websites without using a small tactic,” he said. Azeez referred to the regulations exempting publications from a political party, civil society group, company or state institution to disseminate information among members or staff. “So we’re writing on our website that this poem is intended for members of this association. So we are able to publish now, but that is a very difficult way,” he said, referring to ‘Liyuntheringe Gulhun’ (Writers Association) website. Azeez told local media yesterday that the regulations were “unlawful” and would “put a lock” on Maldivian literature, noting that half of literary output in the country was poetry. “Having to seek approval for a poem in this day and age is a big joke. Paying 50 rufiyaa to approve a poem is also a joke,” he was quoted as saying by newspaper Haveeru. The former Progressive Party of Maldives MP called the regulations “unacceptable” and questioned whether it could be enforced. In a message sent to the media yesterday, former Speaker of Parliament Abdulla Shahid contended that the regulations violate the constitutional rights of freedom of expression, freedom of the press, and the freedom to acquire and impart knowledge, information and learning. Condemning the government’s “decision to impose pre-publication censorship,” the opposition Maldivian Democratic Party (MDP) MP said the move was characteristic of a dictatorship. “Back then even a musician would be required to get approval of the government when they would want to release a musical record. That way the government would suppress freedom of speech and artistic works as well,” he said. Imthiyaz said he was once summoned by a government official who demanded an explanation of the “implicit meaning” of a song he had written. “Because as far as he was concerned it had an unacceptable and hidden meaning in it. And he further said he wanted my testimony in writing because he would be sending the case for criminal prosecution. Free speech and reporting and literature will be a bitter pill to swallow for this authoritarian government,” he said. NGO Revive has also expressed concern with the negative impact on Maldivian literature as a result of the regulations. MPs today expressed concern with the disappearance of Minivan News journalist Ahmed Rilwan Abdulla and called for an expeditious investigation during a debate on a motion without notice submitted by opposition Maldivian Democratic Party (MDP) MP Imthiyaz Fahmy. Presenting the motion, Imthiyaz said the authorities were neither adequately investigating the disappearance nor sharing findings with the family or the public. “[Rilwan] disappeared [11 days ago] while journalists were being sent death threats very openly and while [Rilwan] was also facing various forms of intimidation regarding his reporting,” reads the motion. Imthiyaz referred to the MDP bringing to the government’s attention the abduction and intimidation of alleged advocates of secularism by a vigilante group in early June, noting that no action had been taken to date. He also referred to the arson attack against opposition-aligned private broadcaster Raajje TV and near-fatal assault of Raajje TV journalist Ibrahim ‘Asward’ Waheed. “Malé has become a jail in broad daylight, full of fear. Now since the threats started being sent, the first person, a journalist, has been abducted. In the future, you will see many MPs being brutally murdered. It is being planned and executed now,” he claimed. Imthiyaz meanwhile noted that the case has been submitted to three parliamentary oversight committees “to hold the government accountable” regarding the investigation. Imthiyaz revealed that he received a text message threatening to “behead” him after he submitted the motion yesterday. He slammed the government for failure to provide security for MPs in the face of death threats and intimidation. Referring to Minivan News reporting eyewitnesses seeing a man in dark clothes being forced into a vehicle at knifepoint outside Rilwan’s apartment around 2am on August 8, Imthiyaz questioned police’s failure to investigate the incident after it was reported. “So there is room for us to suspect that police are aware of this and are deliberately not investigating,” Imthiyaz said. Imthiyaz’s urgent motion was accepted for debate with bipartisan support after 51 MPs voted in favour. One MP, however, voted against the motion, which opens the floor for a one-hour debate on matters of urgent public importance. During the debate, opposition MPs criticised police efforts to find Rilwan as sluggish and lacking seriousness, whilst pro-government MPs defended and lauded the police. While Progressive Party of Maldives (PPM) MPs insisted that police were doing everything possible, MDP MPs contended that public safety was no longer assured in the Maldives. However, all MPs stressed the seriousness of the case and extended sympathy to Rilwan’s family, praying for his safe return and wishing success in the search effort’s of family and friends. PPM MP Abdulla Rifau noted that police have searched Hulhumalé for three days and advised against “obstructing” the investigation with unwarranted speculation. He added that the ruling party had put out a press statement expressing concern and calling for a swift investigation. Adhaalath Party MP Anara Naeem suggested conducting awareness raising programmes and teaching self-defence to children and adolescents. Rilwan had been expressing his “independent thought,” he continued, which “sometimes conflicted with some of our tenets and bases”. However, he added, there should be an unfettered environment for free media in a democracy. PPM MP Ahmed Ameeth – a former DhiTV presenter – said journalists were in a state of fear and warned that Rilwan’s disappearance would adversely affect press freedom. “While journalists against capital punishment are going missing, this is something we should really think about,” the former football star said. Thoriq criticised Minivan News for reporting updates on the investigation before police revealed information to the public and urged sharing information with the police. “If [they] want to be the paper that breaks every piece of information the quickest, in truth it is likely that the person they are looking for might not be found,” he said. Jumhooree Party MP Ali Hussain meanwhile suggested fostering a national debate on the issue of disagreements concerning Islam, arguing that there was “a clash” between a conservative or “literalist” interpretation and a more “liberal” interpretation. Rilwan’s disappearance was the result of “intolerance” between the two schools of thought, he contended, advising changes to the curriculum to inculcate tolerance. “We have to teach how to live with people of different opinions. We cannot establish the democratic environment we want without doing so,” he said.